Since 1966, Kartemquin has dedicated itself to supporting independent documentary filmmakers with critical stories to tell. As a creative hub, we give these storytellers a home -- providing resources and guidance -- and partner with them to complete their projects with vision and integrity. Brent Huffman is one of those independent filmmakers. Since 2011, Brent has undertaken a tremendously challenging film, following an Afghan archaeologist as he races against time to save a 5,000-year-old archaeological site in war-torn Afghanistan from imminent demolition. 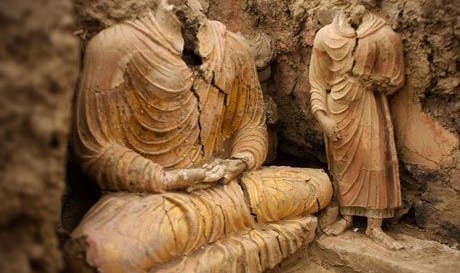 Saving Mes Aynak weaves together a complex narrative – including the threat of destruction from a Chinese mining company, the threat of physical harm to the archaeological team from the Taliban, and the chaos that ensues when several countries attempt to collaborate to save the site – and for years, Brent was alone in his attempt to complete the film. Initially, Brent brought his project to our KTQ Labs feedback screenings program. After consulting with him informally, we took it on as a Kartemquin film earlier this year. We teamed up Brent with Emmy-award winning producer Zak Piper (The Interrupters), and Saving Mes Aynak is now completed. The film just had a very successful world premiere this November at the International Documentary Festival Amsterdam (IDFA), one of the largest and most highly regarded film festivals in the world, and we look forward to bringing it to a global audience in 2015. “There is no way I can do this awareness campaign and outreach by myself – it would be impossible. It is a godsend to have Kartemquin open the doors to their connections, staff, and resources," said Brent. Supporting filmmakers like Brent has always been at the core of our mission. But we cannot do this work without the support of film-lovers like you. Your donation will be used to provide artists the resources they need to tell the stories that can change our world.